When you have a toddler with a cold and want to give them something homemade with love to help ease their symptoms, what do you do? 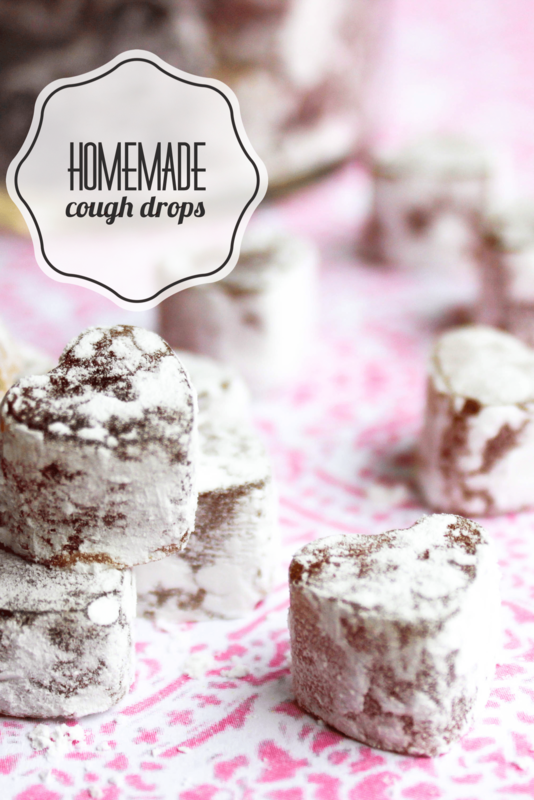 Well, you make homemade cough drops and you make them heart-shaped of course! This was definitely way easier than I thought to make these and I’m so excited to share these with you today. If you would have asked me a few years back if I would have attempted something like this, the answer would have been a resounding “NO”, but not these days. These days I am attempting to try new things that would have once seemed overwhelming or impossible, and definitely not worth my time. But, this is MOST DEFINITELY worth my time and worth sharing with you today. I love my little munchkins and I love making things from the heart to help them feel better when they are sick. What better way to do that than with these cute, heart-shaped homemade honey lozenges? You only need a few inexpensive items to make these and a little patience, You need about a half hour of uninterrupted time – which a busy mom of three like me has plenty of – to watch the honey boil and reach the right temperature. That’s it! These came out perfect and the kids love them! Thank you to WIKIHOW for helping me with this recipe, they had a few options and some great instructions to help me on my way! Try this homemade heart-shaped lozenge drops recipe the next time you need something to soothe a cold or sore throat. To make a tea, a two tea bags into one cup of water in a saucepan. Heat the water and tea bags to a simmer on high heat, then cover and reduce the heat. Let the tea steep for 15 to 20 minutes over the lowest heat. Reserve ½ cup of the tea for the cough drops. Combine all of the ingredients for the cough drops and heat them. Start by putting the ½ cup of herbal tea into a saucepan, then add 1.5 cups of honey. Use a medium to medium-high heat to heat up the ingredients. Stir constantly to make sure all the ingredients are mixed. Clip a candy thermometer on the side of the pan to monitor the temperature. Check the temperature of the liquid frequently. You will want it to get to about 300 degrees Fahrenheit. This will allow the liquid to harden into lozenges as it cools. The mixture may get slightly foamy as it heats up. If this occurs, give the cough drop liquid a stir.You will be able to tell once the mixture gets near to the correct temperature as it will thicken. This process generally takes about 30 minutes. Once the liquid is at a temperature of 300 degrees, remove it from the heat. Transfer the hot mixture into a Pyrex measuring cup to pour it into your silicone molds. Pour slowly and carefully. Pour the hot liquid into the silicone candy mold. Allow the cough drops to harden and cool in the candy molds before storing. Try not to disturb the cough drops as they cool. Once they have cooled, crack the cough drops out of the molds. Coat the cough drops in powdered stevia, erythritol, or powdered sugar. You can store these in single layers between wax paper in the refrigerator for about 3 weeks. You can also freeze them between layers of wax paper. If you choose to do so, they will last for several months. I stored these in a glass mason jar in the refrigerator. I’m so happy I was able to share this with you and show you how easy it is to make homemade honey lozenges. I hope you enjoyed this post and I would love to hear your thoughts. 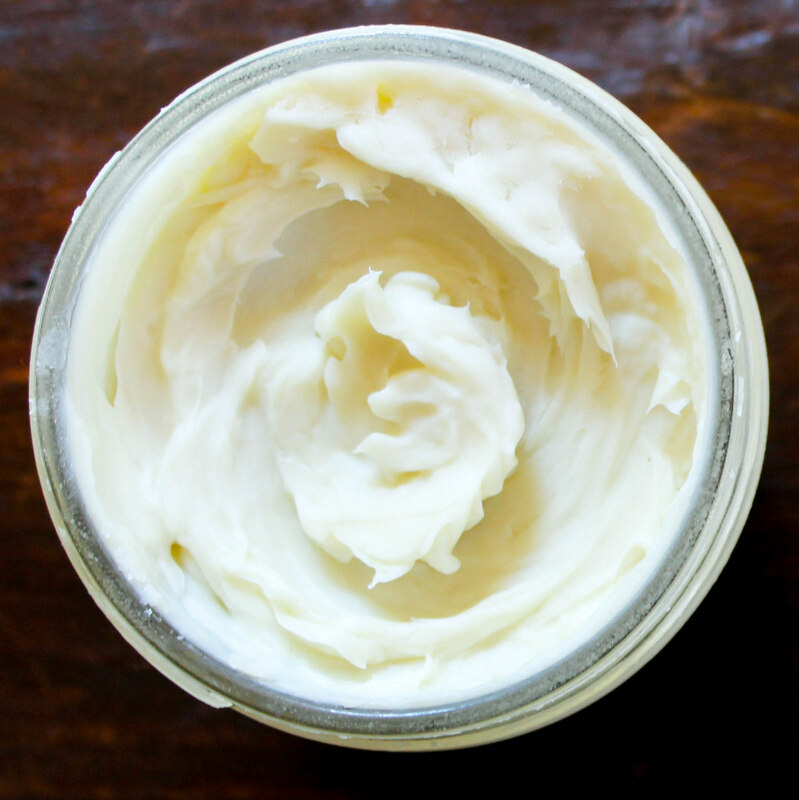 What natural remedies do you make at home? Have you ever made your own lozenges? *I buy therapeutic grade essential oils HERE. *This post contains affiliate links, which means that if you click on one of the product links, I’ll receive a small commission which helps me run my blog. Thanks for supporting Pure Thyme! The holiday season is in full swing and it’s the perfect time to enjoy diffusing and blending essential oils that will help get us into the spirit of the season. There are definitely certain smells that remind us of the holidays and these holiday essential oil diffuser blends are a natural way to spread delightful aromas throughout your home. Candy canes, sugar cookies and warm chai lattes, evergreens and the smell of gingerbread men baking in the oven, are just a few of the holiday aromas that bring back memories and will get you and your family in the holiday mood! 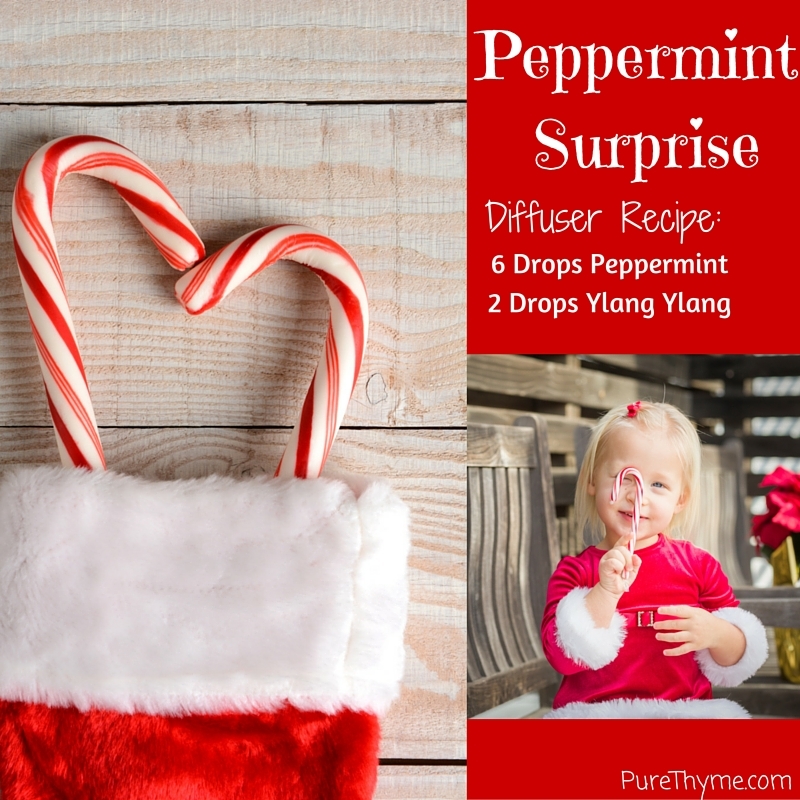 This Peppermint Surprise Holiday Diffuser Blend is just wonderful! It smells just like Candy Canes and the scent is fresh and uplifting. It will also help you get through the holiday craziness with ease. Ah, the smell of homemade Christmas cookies baking in the oven, who doesn’t love that? 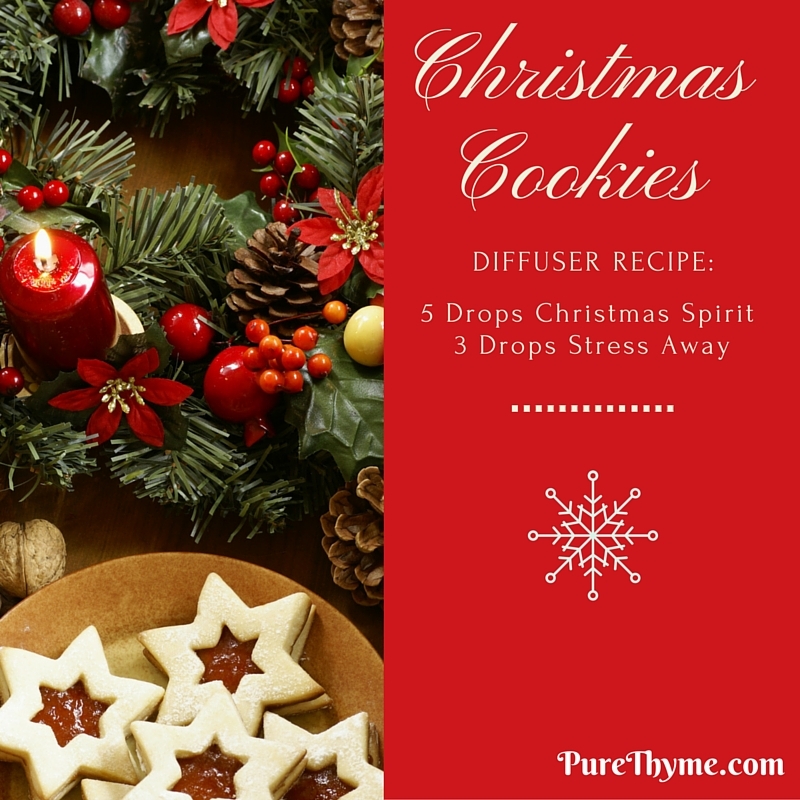 This Christmas Cookie Holiday Diffuser Blend is one you definitely want to try! It is one of my favorites right now. Gingerbread is one of the sweetest smells of Christmas. 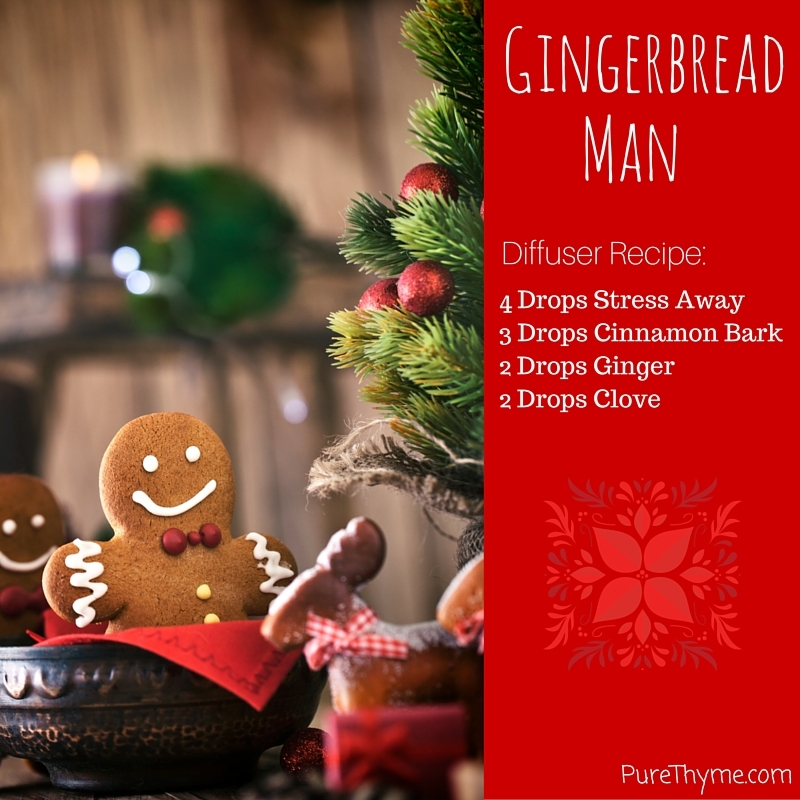 This Gingerbread Man Holiday Diffuser Blend will make your holiday complete with its warm and calming scent. The unmistakable aroma of a fresh cut Christmas tree will always get me in the holiday spirit. 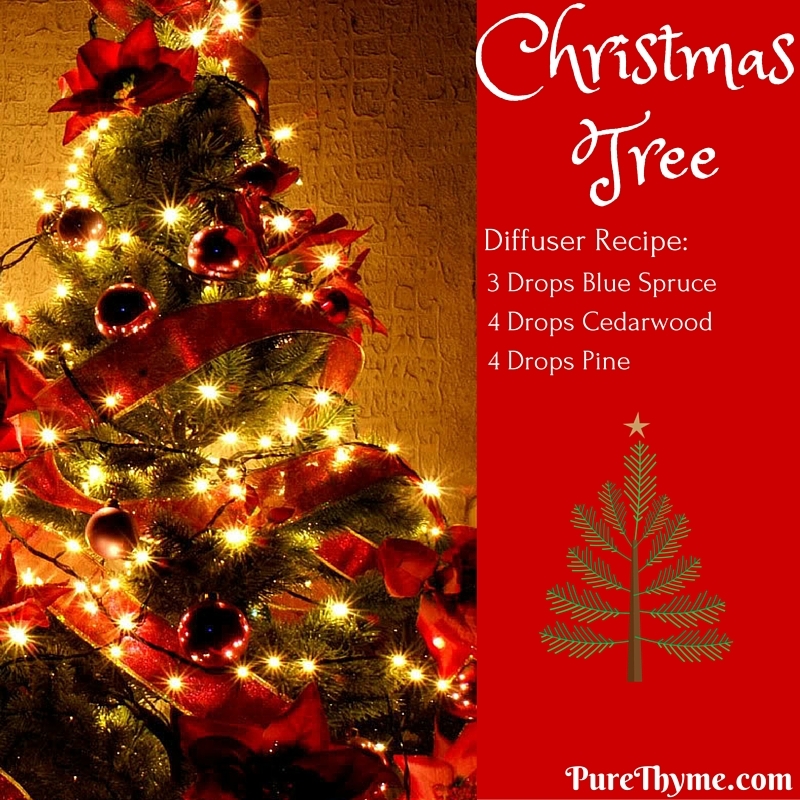 Try this Christmas Tree Holiday Diffuser Blend especially if you have an artificial tree to fill your home with this wonderful holiday scent. 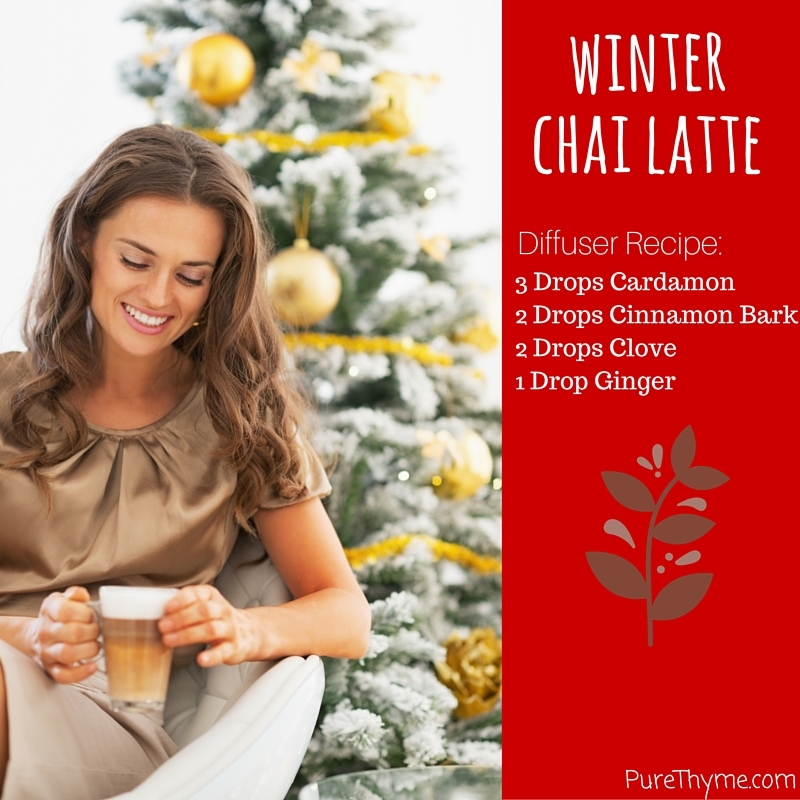 There’s nothing like cozying up to the fire with a Warm Chai Latte. Try this Holiday Diffuser Blend for a relaxing and soothing experience. These holiday essential oil diffuser blends will allow you to enjoy the smells of the season without the use of synthetically perfumed candles. 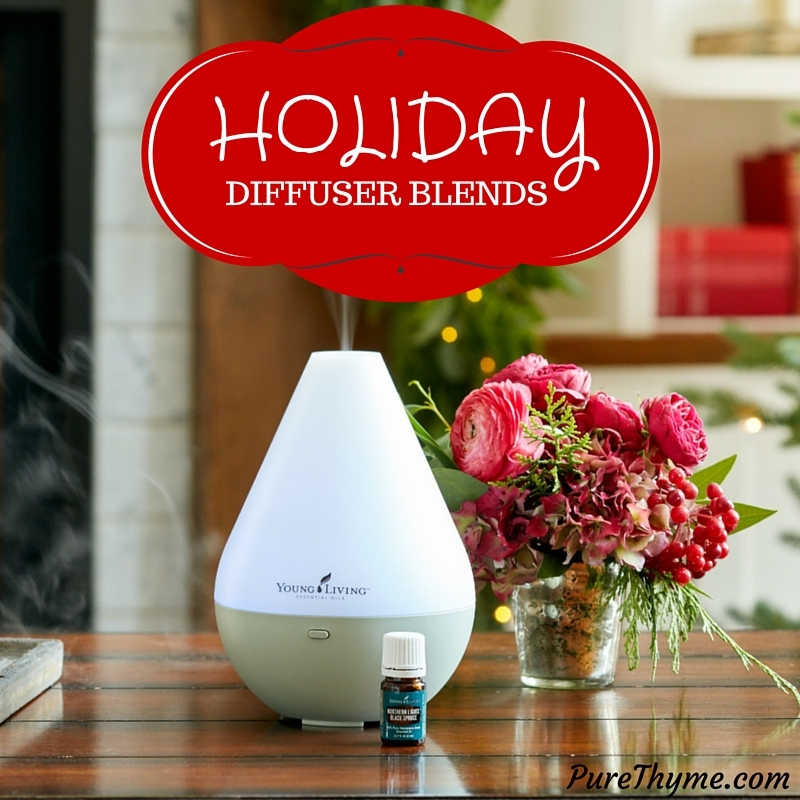 Diffusing pure essential oils at home during the holiday season is a natural way to enjoy those seasonal aromas and bring a smile to your face at the same time! Haven’t tried essential oils yet? Well I’ve got something special for you today! I’m giving away ONE bottle of Young Living’s Christmas Spirit Essential Oil. Please enter giveaway below!